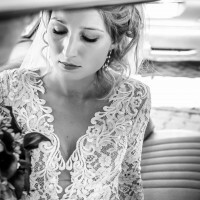 I am selling my perfect wedding dress and I am hoping it will make another bride feeling as fabulous as I felt wearing it on my Big Day. The dress was made by the Polish designer, Agnieszka Swiatly, who specializes in wedding fashion. 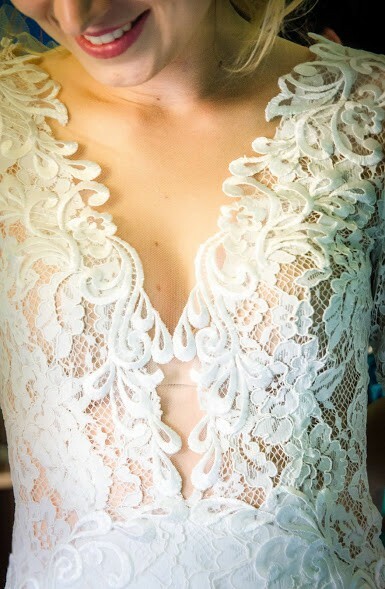 It is made from natural Italian lace in ivory/ white colour. It has a stunning design, very feminine, beautifully emphasizing the body curves. As you can see in the first photo, it has a beautiful front with a V-neckline, with the slight cut again just below the bra to add interesting detail to the front of the dress. Long sleeves add sophisticated look to this floor-length lace dress, which is fitted up to mid-thigh and then flares out delicately. It is a backless dress, with a stunning lace finish, as you can see in the 3rd photo. The dress has a lace train which can be noticed in the 4th photo - unfortunately, it is not perfectly laid out here, but I wanted to show you the length. This adds a beautiful finish to the dress and you don't have to compromise between beauty and comfort as the train can be bustled up (the loop and button are attached). The dress was professionally cleaned and is in perfect condition. You are welcome to visit me and try the dress on. Once you send a message, Agata can invite you to purchase the dress.